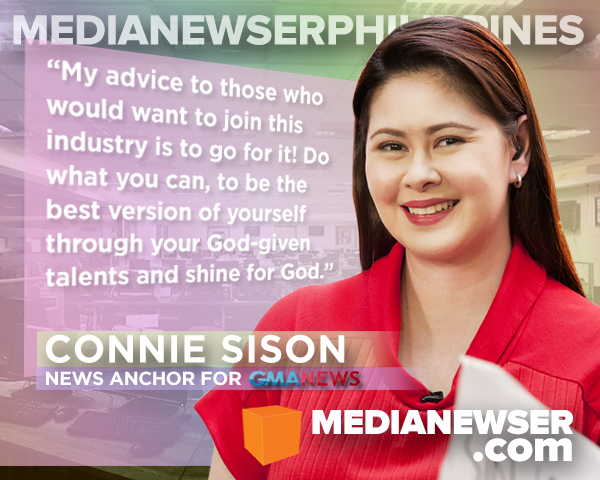 As someone who has been part of the local news business for almost two decades now, Connie Sison needs no introduction at all, but we're going to give her one anyway. A homegrown talent of ABS-CBN News, Sison became a household name in the '90s through her contributions on programs such as Hoy Gising and TV Patrol. She would later on hold the distinction of being one of the first Kapamilya newsers to report on three of ABS-CBN networks: ABS-CBN Channel 2, Sarimanok News Network [now known as ANC] and the now-defunct Studio 23. 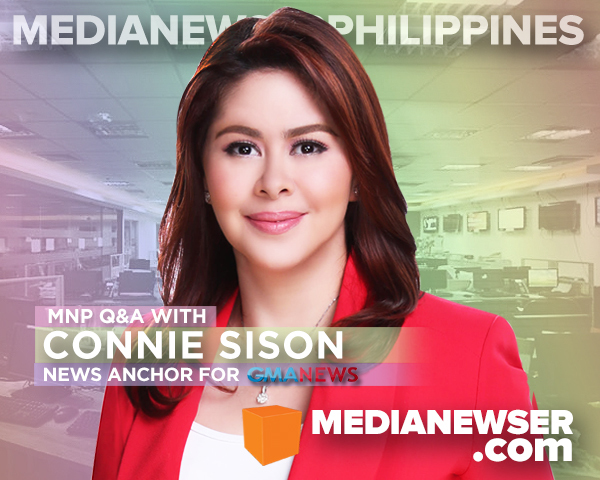 In 2006, Sison left the network and rejoined RPN9 as anchor of its evening newscast — a return to the network where she got her first on-cam assignment. "I went back to them while awaiting my one year non-compete clause in ABS-CBN to end," she says. "RPN9 will always have a special place in my heart." 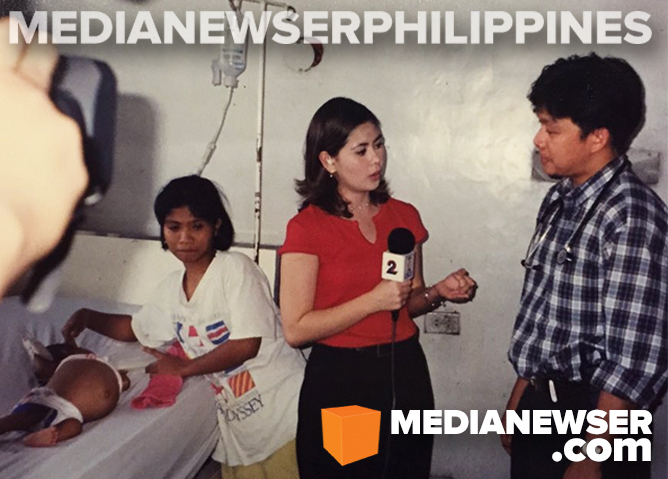 In 2007, GMA News came calling and offered her a chance of a lifetime. 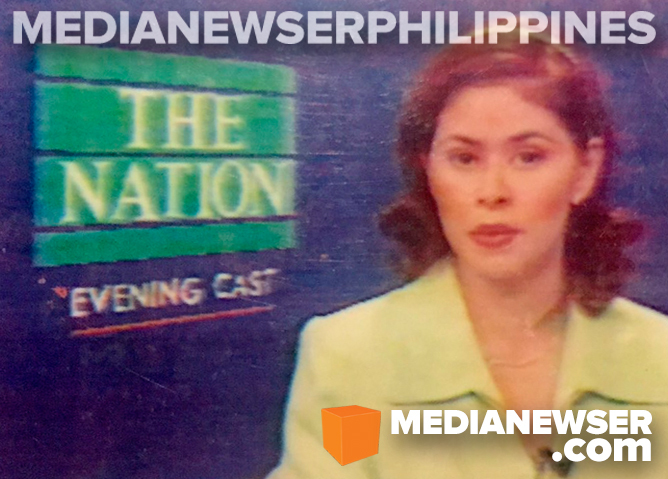 From anchoring its news bulletin Flash Report to filing her reports on 24 Oras, Sison would eventually go on to co-anchor QTV's primetime newscast, News On Q; and host of its public affairs shows, DoQMentaries and PinoyMD. "Next year will mark my 10th year with GMA-7 and praise God, I am happy as ever," she says. "Special thanks to all my bosses who are not only so professional in dealing with all of us, but who I know also genuinely cares for our well-being just like they would their own family." For this edition of MNP Q&A, one of Philippine TV's most respected broadcasters talk to us about her life and career, and her experience working in two of the biggest networks in the country. Be sure to be part of the discussion by tweeting us @medianewserphil or posting your comments below or on our Facebook page. You are someone who needs no introduction at all. But just to warm up this interview, tell us about yourself. Who is Connie Sison both on-cam and off-cam? As an on-cam talent, Connie Sison is your morning barkada in Unang Hirit, your daily news source at noon in Balitanghali, and your health and wellness companion every Saturday mornings in PinoyMD. Off-cam, I am known as Mrs. Connie Escudero. I'm just an ordinary mom to 3 beautiful girls, a simple wife, a faithful friend, a dutiful daughter, a fun-loving youngest to my 6 siblings and an imperfect Christian who is always striving to be the best version of myself in accordance to God's will. As a news anchor for RPN back in 1997. I didn't plan to be a journalist. In fact, in college, I took up BS Psychology thinking that I would put up my own pre-school and teach kids. But that didn't work out because I had to attend to personal matters. Back in 1997, after praying for God to guide me on my next career move, I remember turning on the TV and seeing a lady news anchor doing the newscast on RPN9. For some strange reason, my heart jumped for joy. I just knew in my heart that I would become a newscaster myself. That same day, I drafted my resume, practiced a bit by reading the newspaper and went to RPN9 as a walk-in applicant. To make the long story short, I got a call after a few weeks and and got hired. My first job was to pinch-hit for another anchor who was on leave for a week. I co-anchored the 5PM newscast with Ms. Cielo Villaluna. Thank God she was so gracious and kind to a newbie like me. After my week long stint as a pinch-hitter, I got calls from Sarimanok News Network [now known as ANC] and Studio 23 — both of which, I forwarded my resume to, apart from RPN9. "I would sum up my career in ABS-CBN as 9 fruitful years. I learned a lot there. I was blessed for many years with the great programs that were given to me." Walk us through your first foray in the industry. How different was the broadcast news industry back then? I opted to join Studio 23 in 1997 as a features reporter. I thought it would be wise to become one of the pioneer reporters there since it was launched a year before I joined. It was so different the way we did things back then. I had to learn the ropes on my own on the field. It took a lot of guts to ask the simplest of questions since I didn't have any background in news gathering and didn't get to tag along with a seasoned reporter to train me. It was just me and my crew right away. I wasn't spoon fed so to speak. I learned everything I know mostly by researching, observing my colleagues, intently listening to every news item and obeying instructions from my bosses on how things should be done, conversing with everyone working in the company from the bottom to the top level and asking everything under the sun particularly with the late Ka Kiko Evangelista who was then the news manager of Studio 23 and who was my very first mentor. I was honest in admitting that I knew nothing then but was so eager to learn because I want to make it in this industry. My hard work paid off because after just 8 months of doing feature stories in Studio 23, I was promoted to cover hard news for TV Patrol and the rest as they say is history. Tell us about your experience working for the public service program Hoy Gising. When I joined Hoy Gising, I was so scared and excited at the same time. I knew I was so blessed to be a part of such a great public service program. Mr. Ted Failon became one of my very first mentors as well. He taught me a lot of things that I treasure until now. Recently, I had gotten the chance to have a reunion with some of my colleagues from Hoy Gising, and it's great to know that after all these years nothing has changed. The people that I worked with back then, are still the same wonderful people now, just a little bit older but definitely wiser. Doing a story for ABS-CBN's now-defunct public service program Hoy Gising!. Your departure at ABS-CBN was highly-publicized. For someone who at that time was doing quite well, what was then the biggest challenge for you in leaving your mother network? When I left ABS-CBN in 2006, it was bittersweet. Naturally so, because I grew up in that network. It was hard at first to welcome change but then, as I always do when I'm at a crossroads in my life, I prayed for guidance and realized I had to move on and embrace change because I knew there wasn't anything in store for me anymore. I wasn't growing career-wise. The whole company quite frankly at that time, was in disarray. I gave my resignation to our then President, Mr. Alejandro, and availed of ABS-CBN's early retirement package. How would you sum up your years at ABS-CBN News? I would sum up my career in ABS-CBN as 9 fruitful years. I learned a lot there. I was blessed for many years with the great programs that were given to me. I still enjoy the friendships I made there and I will forever be grateful to my mentors, namely, Tita Arlene and Noli De Castro who treated me like a daughter while I was in ABS-CBN. There are so many people that I am honored to have worked with. I won't be able to mention all their names here, but they have helped in molding me as a journalist. I will forever be grateful to all of them. After ABS-CBN, you made a jump to RPN9 as anchor of their early evening newscast. What did you learn from working there? It was in RPN that I was first given the chance in the industry as a walk-in applicant in 1997 and after almost a decade, I went back to them while awaiting my one year non-compete clause in ABS-CBN to end. RPN9 will always have a special place in my heart. Special thanks to Ms. Mackay Cuadra who was my executive producer for Aksyon Ngayon for the friendship that lasted even after our program had ended. About a decade ago, GMA-7 came calling. Walk us through that moment when you first learned that they were interested in hiring you. 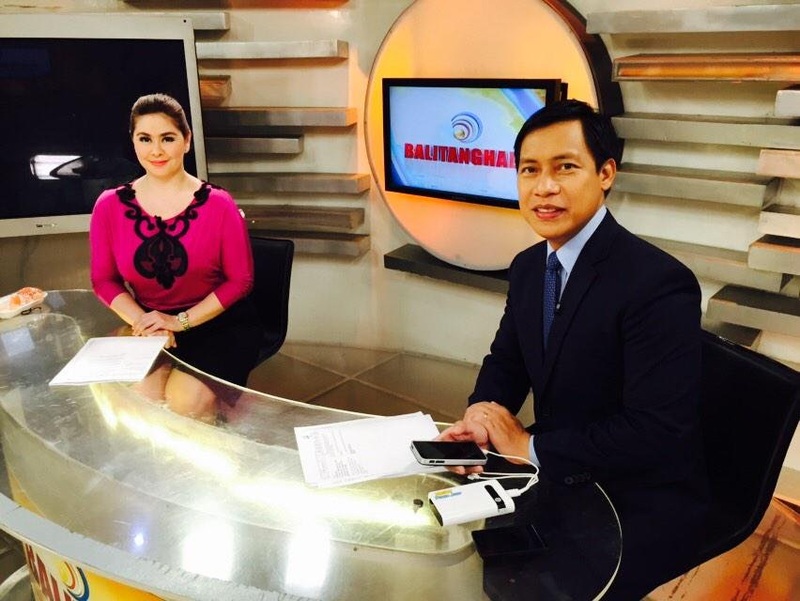 With her Balitanghali co-anchor Raffy Tima. God is always good! One of my many personal favorite experiences with God was when He opened doors for me in GMA-7. I prayed to Him as I always do for guidance and He gave me the best answer over a span of 8 month. Next year will mark my 10th year with GMA-7 and praise God, I am happy as ever. Special thanks to all my bosses who are not only so professional in dealing with all of us, but who I know also genuinely cares for our well-being just like they would their own family. Again, there are just too many names that I would like to acknowledge from GMA but don't have the space for. Nonetheless, I am happy to keep their names in my heart. I'll always be grateful to God for them. And it seems that you are enjoying being a Kapuso. What has been the most rewarding thing about being a journalist for one of the biggest networks in the country. The most rewarding thing about being a journalist for GMA-7 is the feeling of being entrusted with so many important coverages. I just love that I'm enjoying the management's trust and confidence all these years. I will always treasure moments when I was asked to cover the Royal Wedding in London, Pacquiao's yearly bouts in the states, and a lot of other important local events and news stories. These, apart from the three programs that they are currently also entrusting me. This year marks your 6th year as host of PinoyMD. How has the show evolved over the years? Connie with her PinoyMD team. 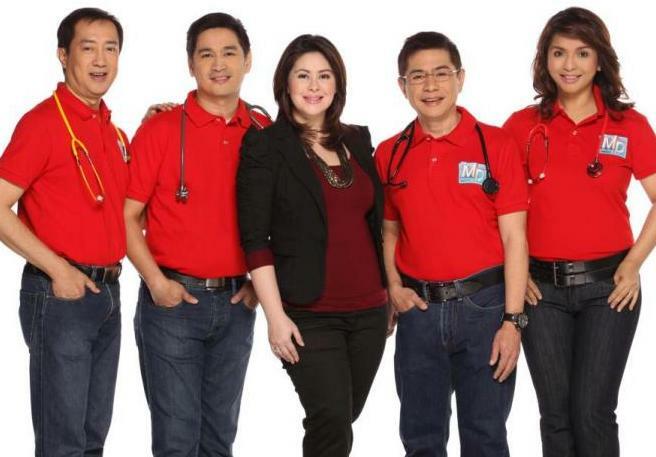 Pinoy MD has evolved mainly not just on giving health tips to our viewers, but moreso in being pro-active in propagating lifestyle change amongst Filipinos. Last year, the Pinoy MD hosts, together with our director, Chris Pablo, supported a health and wellness festival in Q.C. where we had film showing to propagate healthy living, we also invited speakers from abroad who made extensive research on health and wellness and shared their knowledge with students. We also supported farmers by re-introducing their organic products to the market through our event. You've hosted and anchored a number of shows for GMA News TV and Q - DoQmentaries, On Call and News on Q. What did you learn from being part of these shows? Most of the programs that were entrusted to me by GMA-7 management before and until now are directly related to public service. With this, I learned that helping people goes far beyond the allotted airtime that we have. The hosts, as well as the staff and crew and everyone involved in running a public service program will have to be prepared to help wholeheartedly 24/7. You are no stranger to morning news so we weren't surprised when GMA-7 asked you to co-headline the long-running Unang Hirit. What's the best thing about hosting a morning show? Also, why do you think viewers remain loyal to the show? To me the best thing about hosting a morning news program like Unang Hirit are the the great and wonderful people I work with everyday. From the bosses, and my co-hosts, to the staff and crew, they all make waking up at 3AM worth it! I think Unang Hirit remains to be on top because of the genuine friendship that translates the real camaraderie amongst the hosts to our viewers. It's hard to fake that level of sincerity esp in the morning. "The most rewarding thing about being a journalist for GMA-7 is the feeling of being entrusted with so many important coverages. I just love that I'm enjoying the management's trust and confidence all these years." Your interview with Erap Estrada in 2013 remains one of the highlights of your career. It reminded us and the viewers why you are one of the most capable live interviewers in local TV. Tell us about that particular coverage — what did you learn from it? The Bus Ban coverage with Mayor Estrada and Atty. Topacio was one of my most memorable ones as a reporter. I guess it is because none of us knew what would happen next. It was both scary and exciting. Scary because I really, honestly am a scaredy cat in crossing streets. On hindsight, I guess I went into a trance while covering it, which is probably why I was able to to do my job smoothly in the very busy street of Mabuhay Rotunda. It got exciting with the exchange of words between Erap and Atty. Topacio. I was thinking to myself, "Grabe, baka magkagulo, mainit na sila pareho." But I had to keep on asking questions because I was on the air the whole time. Thank God it ended peacefully. Aside from that, what other news coverages do you consider as part of the highlight/s of your broadcasting career and why? I had the opportunity to cover The Royal Wedding in London. It was very fulfilling as reporter because you get to see history unfold before your eyes. It's one of the perks of covering historical events. I can't wait to tell my youngest daughter the details of such wonderful coverage when she's older. I also consider my coverages for Manny Pacquiao in the states memorable and exciting, especially the fight that he had with Floyd Mayweather Jr. Our viewers just don't know the challenge we go through in covering these kinds of event with other international news agencies. It was tough. Sometimes, to the point of having experienced discrimination from our peers abroad. But then it's always uplifting to know that we are able to rise to any challenge that we encounter at the end of every coverage. Praise God! My closest friends in the industry are my co-hosts in Unang Hirit. Who do you look up to in the business, and why? I look up to all our pillars in GMA News. They all possess different skills that I admire and would like to emulate. 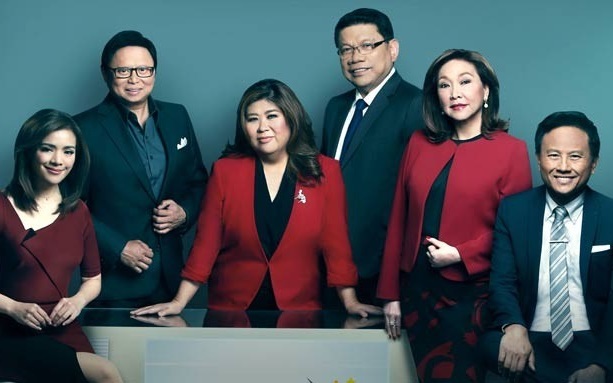 Ms. Jessica Soho is ever so good at giving her news analysis, Mr. Mike Enriquez is always equipped with the right information in annotating events, Ms. Mel Tiangco delivers the news segment from the heart that any viewer would get glued to her. Ms. Vicky Morales exudes such happy aura and confidence — I just want to always be around people like her, Mr. Arnold Clavio is super witty and funny, and is very good in conducting interviews. And Mr. Howie Severino has impeccable integrity. I am married to a wonderful man named Chris And we have 3 beautiful daughters. My family, second to God, is my driving force in wanting to be the best person I can be. I love that they are always rallying behind me, pushing me when I'm almost about to give up and giving me great comfort at all times. I'm grateful to my husband for being so supportive of my career. He is one of the most secured human beings I know and I love him even more for that. I am truly blessed to have my family around. "There are so many things that I wish I could still have the chance to do even with my almost 20 years in the industry. But for now, I have learned to be content with where I'm at. I just take things one day at a time." You have spoken publicly about your mom. What are some of the great life lessons that you have learned from her? I guess the best life lesson my mom ever taught me is to have a real and deep relationship with God. Because then, she said, no matter what I will go through in life, she will always be at peace knowing that if I trust God enough, live my life for Him, and always try to follow His ways, I will always be fine. I'm grateful to her because I have proven numerous times that what she told me is true. God provides stability in my life. Back when you were starting, there were no social network sites. But today, with the advent of it, even respected journalists such as yourself are becoming an easy target of online trolls. How do you deal with these people? I am resolved with the fact that I can't please everyone. There will always be someone out there who would not like me even if I am not doing anything to them. Angry people will always find fault in everyone they encounter. But the best thing to do is just ignore, block them and move on. After all, at the end of the day, I am blessed with a happy life. I just pray that bashers would also find their peace and real happiness. You're about to mark your 20th year in the business in 2017. Is there anything that you haven't done yet that you hope you could accomplish soon, career-wise? There are so many things that I wish I could still have the chance to do even with my almost 20 years in the industry. But for now, I have learned to be content with where I'm at. I just take things one day at a time. I try to enjoy the good moments, move on as fast as I can from the bad, and just continue to pray that God will give me more good years in this industry. My advice to those who would want to join this industry is to go for it! Do what you can, to be the best version of yourself through your God-given talents and shine for God.